This was the last weekend the Sox would play at Fenway this year. Saturday, Derek Lowe got the chance to make his first start since June, 1998. Although he had pitched well as a starter in '98, he had received little run support, and had only an 0-7 record to show for it. He was moved to the bullpen for the remainder of the season, was good in a setup role in '99, and took over as closer in 2000. But this year he had struggled, and the Red Sox planned to convert him back to a starter for the 2002 season. This start and any he would make for the rest of 2001 would serve as an audition for the following year. He did a good job that day: 5 IP, 0 R, 3H, 0 BB, 5 K. And when he left after five innings, solo homers by Trot Nixon and Brian Daubach had given the Sox a 2-0 lead. I don't know if there were any games this year that Rolando Arrojo started which Lowe blew in relief, but Arrojo got the chance for payback when he entered the game in the sixth. After an infield hit and a Hillenbrand error, Damion Easley's two-run double tied the game. While Arrojo was pitching, two relievers started warming up in the bullpen, #46 (a lefty) and #55 (a righty). The guys sitting in the row behind us were the type who talked too loud the whole game, as if they were such the experts that everyone needed to hear what they thought about everything. They noticed that one of the pitchers was left-handed, and concluded that he was obviously Casey Fossum. Problem was, Fossum had just started the previous night's game, so there's no way he would have been coming in in relief. I didn't want to be one of those people who join a conversation they're not a part of just to contradict somebody, so even though I knew the two "mystery men" were Allen McDill and Todd Erdos, I decided to let it go. (And if they had looked here on RedSoxDiehard.com's Uniform Number List, they'd have known too!) I was holding a scorecard. If they really wanted to find out, all they had to do was ask. (Of course that would mean a girl knew something about baseball that they didn't.) They kept calling out as if Fossum were around, "Time for Casey's American Top 40!" I tried to help out, turning to my brother and saying, "Oh boy, McDill and Erdos? I don't know which is worse," but they were too busy with their own comments to hear mine. I was starting to be embarrassed for them after a while - we were sitting right behind the bullpen, and I was hoping the pitchers didn't think all fans were clueless loudmouths. McDill had been called up a month earlier when Bill Pulsipher was designated for assignment, and had appeared in several games, albeit with little success. Detroit's Shane Halter hit a solo homer in the seventh, and the Tigers scored another run in the eighth to take a 4-2 lead. (Tony Clark entered the game as a pinch-hitter in the eighth, and struck out to end the inning. He would end up signing with the Red Sox as a free agent after the season.) Troy O'Leary hit a solo homer in the bottom of the eighth. I thought back to a Tigers-Red Sox game in June which the Sox had won 4-3 in 18 innings. All their runs that night had come from solo homers, too. Unfortunately they didn't score any more runs this time, and lost 4-3. My final game of 2001! I went in as soon as the gates opened, because I knew it would be a while until I could come back. I grabbed my last Italian sausage of the season (making sure to tip the vendor, because his "tip jar" was a paper plate with "Craig Grebeck Retirement Fund" written on it), and headed to my seat. The Tigers were taking batting practice. In the picture on the left, Tony Clark and Jose Lima sign autographs for the fans in center field. Lima was clowning around all during batting practice. While the other pitchers looked bored just shagging flies, he was busting a few dance moves to the music coming over the loudspeakers. A number of balls had been hit into the Red Sox bullpen. The fans behind the bullpen wanted someone to throw some up to them, but there were no Red Sox players around. So Jose Lima leaped the wall into the Red Sox bullpen and started throwing every ball he could find there into the crowd, to much applause. Before he jumped back out again, he helped himself to a tomato - a green one - and ate it on his way back to join his teammates. Sadly, batting practice was the most entertaining part of the day's game. Hideo Nomo pitched like he had when he was on the Tigers the year before. He gave up one run in the first, two in the second, three in the third, and (with the help of Sun Kim) four in the fourth. The Red Sox gave their rookies a chance to play - Angel Santos, Izzy Alcantara, Morgan Burkhart, Calvin Pickering, and James Lofton all saw action. Lofton picked up his first major league hit (a single in the second) and RBI (a sac fly in the sixth). Both Allen McDill and Todd Erdos pitched again. When a beach ball escaped from the bleachers and landed in the bullpen, Tim Wakefield hit it back into the stands. That's noteworthy because they're usually confiscated as soon as they go over the wall. In the 80's, Bob Stanley was even known to pop them with a rake. 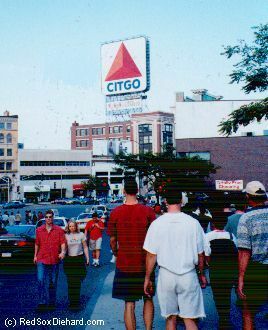 When the game ended, I gathered my gear, took a last look around, and headed back to Kenmore Square to catch the T. Another year was over. But despite the depressing end, there were a lot of fun moments, and I can't wait to go through it all again next year. Because in baseball, there's always next year. No, not the season quite yet - there are two weeks left and we haven't been mathematically eliminated yet. Not our chances - those evaporated Labor Day weekend. My season at Fenway is over. I went to my 24th and final home game of '01 yesterday. And what did I get for my troubles? A 12-12 record. Flat .500 even. Maybe I'm getting spoiled - after all, up until last season I was never able to get to more than one or two games over the course of the summer, and now, finally... 24! Four games every month! Add to that my 4-1 road record in NY, Montreal, and Baltimore, and it was surely a summer well spent. I got to see the home opener - my first ever Fenway opener - when Manny took the first pitch he saw over the Green Monster to tie the game. I went back two days later, in 42-degree drizzle, and saw Pedro spin a 16-K masterpiece over the Devil Rays. Later that month I saw perhaps the rarest feat of the summer - one of Grebeck's two hits! I got to sit in the front row near home plate for the 100th anniversary celebration and game. I saw Manny hit the lights in the light tower over the Monster for his 501-(wink, wink)-footer. I went to Montreal and saw El Guapo's attempted bunt. I was almost visible on TV (my arm and hat were showing) when a Daubach homer was caught by the guy sitting next to my brother. I got a batting practice ball from a Cleveland player in September, but I never did manage to get a tomato from the bullpen. But I think my favorite game to go to this summer was July 29 - Nomar's comeback game, in which he homered and later had the game-winning hit. It was a fun season! But losing that game Sunday left me at .500 at home. I took one last look around as I left. I live in an apartment, so I don't have my own yard, but this summer Fenway was my back yard. I hung out there a couple of days every few weeks, always arriving early and staying until the often-bitter end. And now I won't be back until April. The Sox open at home next year - on April Fools' Day, appropriately enough. It'll be cold, maybe even snowy. Pedro will be pitching and WEEI will be handing out "K" cards. I will have forgotten all about how depressed I feel today, and how angry I used to get about Dan Duquette and Carl Everett and the rest of those bums, and how bitter I was about the way 2001 turned out. I will be completely convinced that, with Nomar and Pedro healthy and whatever free agents we will have signed, 2002 will definitely be the year. I can't wait! 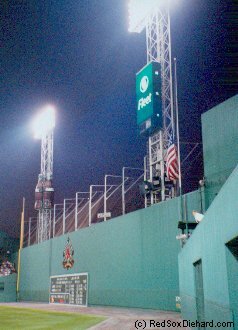 If you enjoyed my accounts of the 2001 season, you'll love Feeding the Green Monster by Rob Neyer. It was reading his book about the 2000 season that inspired me to write about my experiences in 2001. You can read the first chapter online by following the link below. 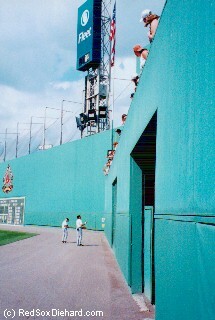 Feeding the Green Monster, by Rob Neyer. The ESPN.com columnist who grew up a Kansas City Royals fan proves you don't have to be from Boston to appreciate Fenway Park. Neyer attended every home game at Fenway in 2000, and his book chronicles the season from a baseball fan's viewpoint. Experience sitting through a cold April game, catching a foul ball, and witnessing a walk-off homer as if you were in the stands yourself. This page and all photos copyright © 2001-2002 by Kristen D. Cornette.